Who loves a one pot dish? I know I do. When I am busy baking, gardening, or let’s be honest, having some chill time in the garden and catching some rays – knowing that dinner is already made can really take the pressure off. 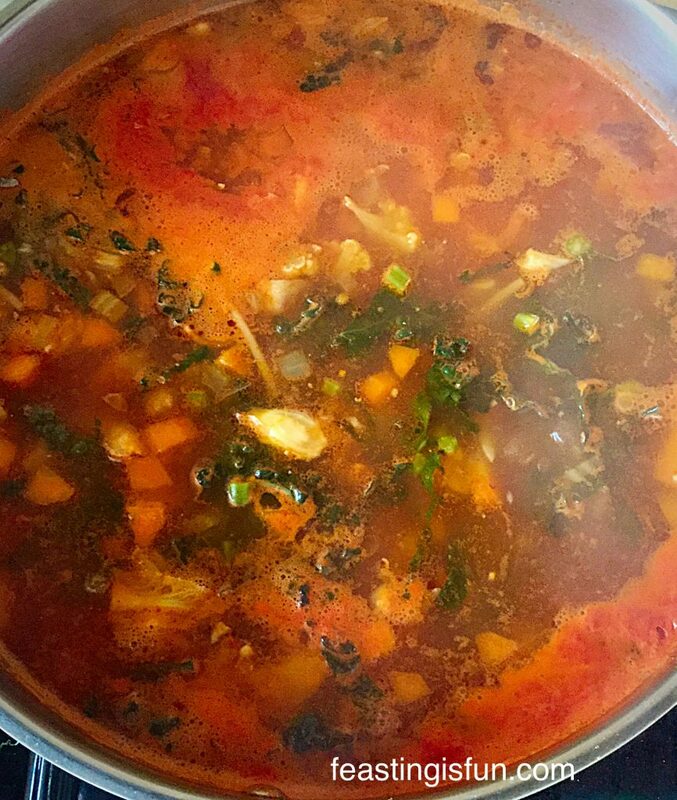 So in the spirit of sharing, that is Feasting is Fun, may I present to you my Hearty Minestrone Soup. 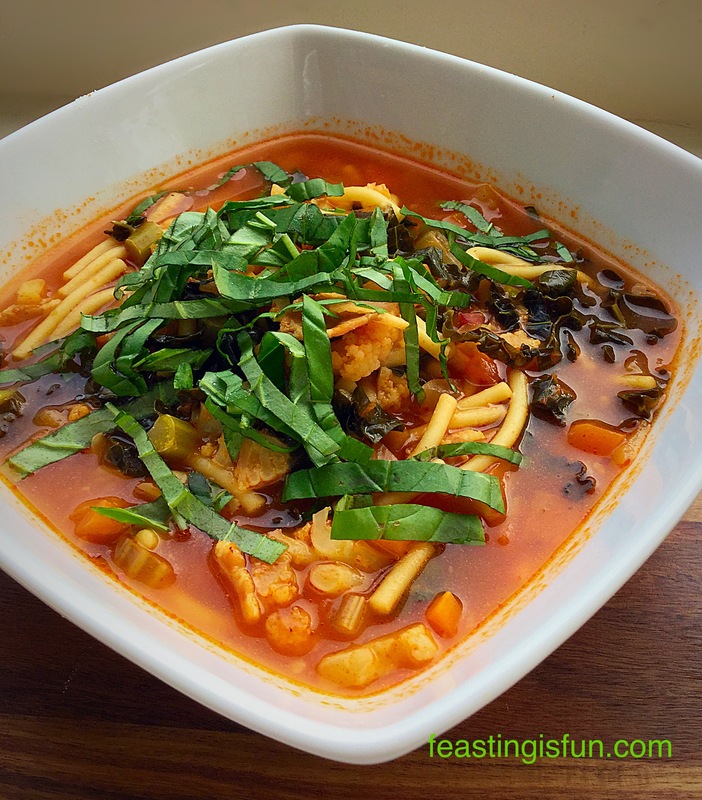 Hearty Minestrone Soup a great one pot, make ahead meal. For the record, may I just say that I LOVE SOUP!! Because honestly, the number of recipes on this site simply doesn’t reflect how many times I make soup, both for lunch and dinner. I am definitely working on rectifying that. 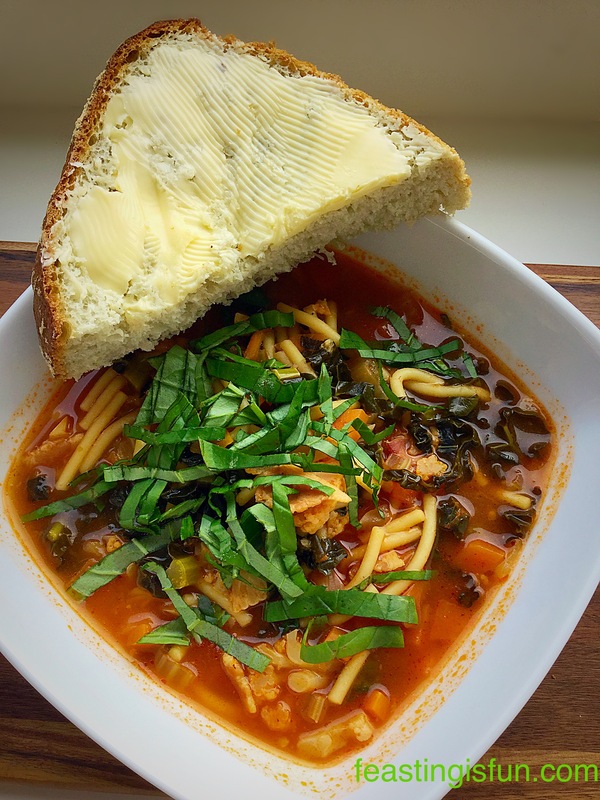 Hearty Minestrone Soup served with a thick slice of buttered, homemade bread. I have never held with the notion that soup is simply for eating during Winter and the colder months. Even though today it has been quite a warm, humid day and yet this Hearty Minestrone Soup really has hit the spot for dinner. Also being able to make this soup earlier in the day, has left me free to carry out some much needed recipe write ups, secure in the knowledge that dinner has already been made. The smoked bacon provides a delicious, yet subtle background flavour to this vegetable packed meal. If you are a vegetarian simply leave out the meat and opt for vegetable stock instead. Following some initial research I have found that there isn’t actually a set recipe for minestrone soup. Italian in it’s origins, it varies from region to region and no doubt household to household. The key to making this soup the very best meal, is to use the best quality, seasonal ingredients that you can afford. Let’s be honest, this is an incredibly budget friendly meal. 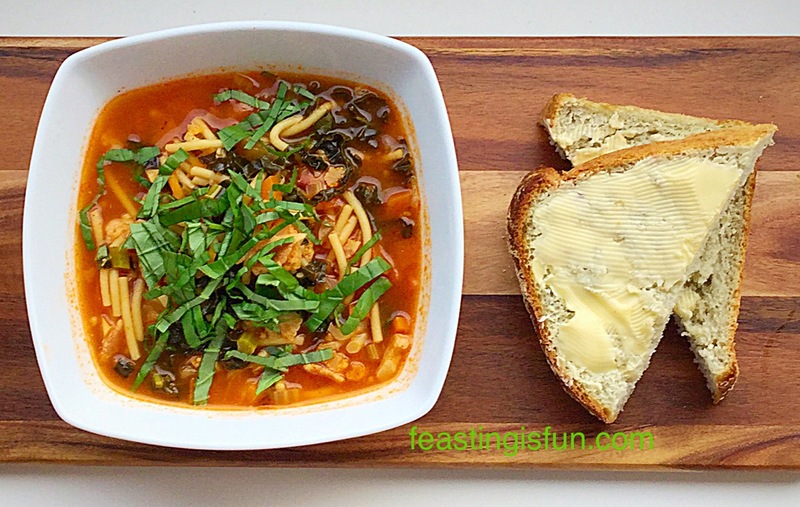 Hearty Minestrone Soup a one pot wonder dish. Even a full English Breakfast wouldn’t feed six people using a few rashers of bacon! While I have listed specific vegetables and quantities in the recipe below, please feel free to switch things up and use whatever seasonal, abundant vegetables are available. 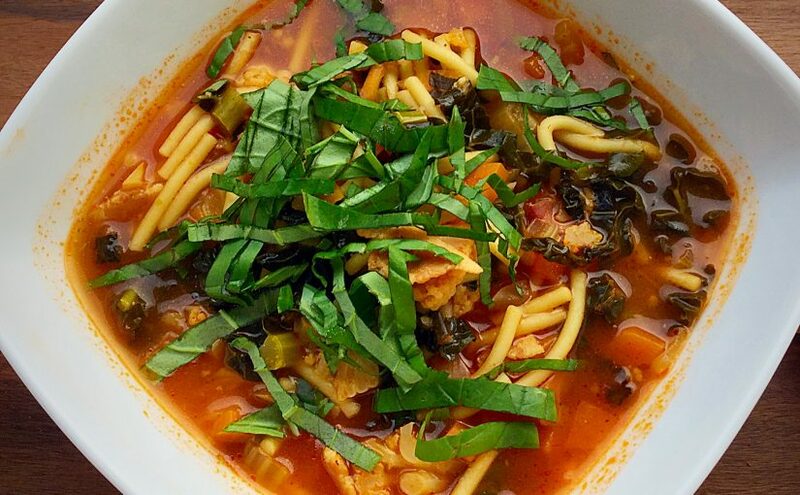 I am very much hoping to recreate a version of this Hearty Minestrone Soup at the end of the Summer, with produce grown in our garden. The new garden diary section on Feasting is Fun will be up and running soon. The aim being to help and encourage you to grow a few salad items and vegetables in containers. The reward is immense when you can actually pick your own produce from the garden and then use your ingredients in a recipe. Sea Salt and Freshly Ground pepper to season. First of all the olive oil to a large, heavy based pan and place over a medium heat. Finely dice the onion, add to the pan and cook until the onion turns translucent. Next add the roughly chopped bacon and continue to cook until the bacon is starting to crisp. Finely chop both the carrots and celery and then add to the pan. Cook for a further 5 minutes and then add the minced garlic. After 1 minute add hot water from a recently boiled kettle and the tomato purée. Scrape any caramelised brown bits from the bottom of the pan, these are packed with flavour. Thinly slice the cavalo nero and cauliflower. Add both of these to the soup. Crumble in the stock cube and add the chilli flakes. Ensure that the saucepan you are using is two thirds full by adding extra hot water from the kettle. Break up the spaghetti into roughly 2.5cm/1″ pieces and add to the soup. Add a good amount of freshly ground, black pepper and 1/2 teaspoon of sea salt flakes (1/4tsp if using free flowing table salt). Bring the soup to the boil and then reduce to a simmer and cook for an additional 30 minutes. Hearty Minestrone Soup reducing over a low heat. After the cooking time has elapsed check the soup for seasoning and adjust as necessary. 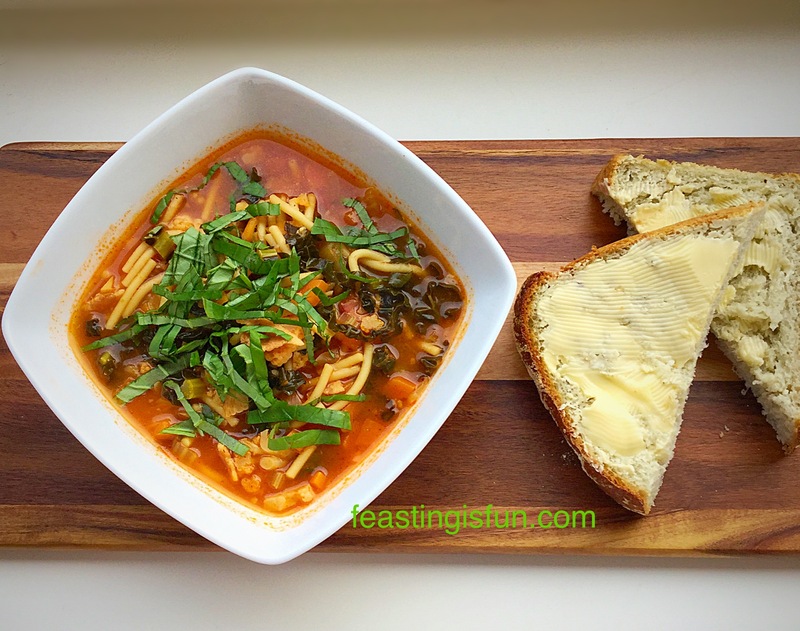 Hearty Minestrone Soup served with crunchy bread. To serve, ladle the soup into deep bowls, sprinkle over ribbons of fresh basil and add thick slices of homemade bread, such as this Farmhouse White Loaf. This Hearty Minestrone Soup can be kept in the fridge for 3 days or frozen for up to 3 months. Cool the soup completely and then ladle into individual freezer safe, plastic containers. Label and pop in the freezer. 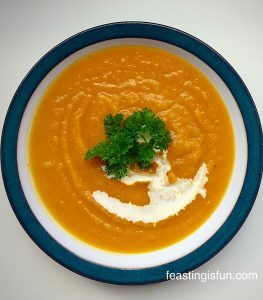 I prefer to freeze soup in individual portions as it is easier to remove just one portion, during the week for lunch. To reheat, run hot tap water over the bottom of the sealed, frozen container. Remove the lid, the frozen, solid block of soup should release easily into a saucepan. Add a splash of hot water from the kettle and gently cook over a low heat until the soup has defrosted. Increase the heat to ensure that the soup is piping hot. Serve as for fresh soup. Hearty Minestrone Soup a meal in a bowl. I have been making versions of this soup for years, however, I think the addition of the cavelo nero added such a depth of flavour, this may be my favourite version so far! 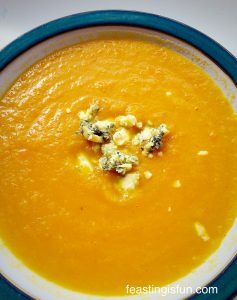 Roasted Garlic Butternut Squash Soup a great vegetarian dish. 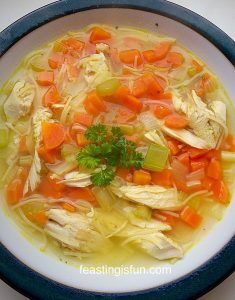 Roast Chicken Noodle Soup another inexpensive meal. Carrot Soup simply a hug in a bowl. While writing the post for the unbelievably delicious Chicken Herb Burgers, I talked about the relative cost of buying good quality meat and how I’d rather pay more, for non intensively reared animals, off setting this by eating great meat less often. As a result this recipe contains a mere 6 rashers of bacon and feeds six people. That for me is balance. Do you have a favourite soup recipe – homemade or canned? Do you view soup as a meal in itself, or simply an appetiser or light lunch? 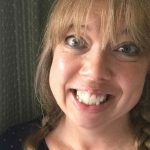 Have fun making and baking in the heart of your home and thank you for the wonderful comments and fantastic photos that you are putting on Twitter and Instagram. I never take for granted the trust you place in me when following any of my recipes, which is why I try my hardest to get them right before I share them here, on Feasting is Fun.